5 Card Stud Poker is quite similar to the more popular variety, 7 Card Stud Poker. The big difference between the two games is that every player gets five cards, and only 1 of these is hidden from opponents. The result is that your winning hand is mostly not as strong as in other types of poker – and that a pair can result in taking down the pot. Players start by posting an ante before their cards are dealt. This is only a small bet and these starting bets will form the starting pot. Each player then get two cards, 1 face-up and visible to all players, and 1 face down. The 5 cards stud poker player with the lowest showing card starts the wagering with what is called a forced bet. This is also called a bring-in and this player can choose whether he wants to raise at this stage. The other three cards are all dealt visible to everyone and every dealt card is followed by a round of betting. Every card and wagering round is called a street. The betting limit normally doubles after the fourth street. You are usually only allowed to raise four times on every street. A pair is a good starting hand for 5 Card Stud Poker. Any pair is seen as the best starting hand, and you should play this strongly. Since pairs are a rare occurrence, you need to consider other hands. High-card combos are good, especially your highest card is better than those visible cards of your opponents. You can't just play 2 cards to a straight or flush, but if these cards are high, it will give you a better chance of winning. 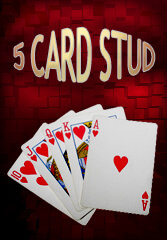 In 5 Card Stud Poker, as in all stud varieties, you must keep a note of the other player's cards. This will allow you to know when the right time is to fold, usually when you have seen many of the cards you need being discarded or being kept in opponents hands.